She Loves Me is sharing the Broadway season with its composers’ big hit Fiddler on the Roof, and yet the two shows could not be more different. 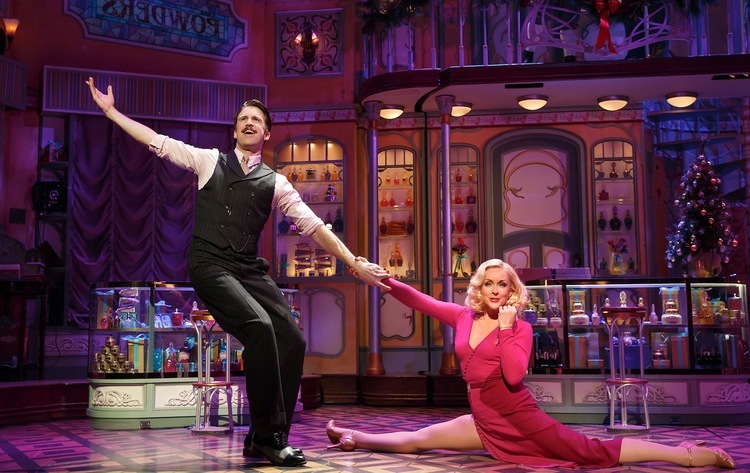 A sugar-spun confection of pure entertainment She Loves Me is actually different to a great many other Broadway musicals in that is essentially a chamber musical with a strong focus on its lead characters. The few featured moments for the ensemble are heavily stylised, with the centerpiece being the lurid action of “A Romantic Atmosphere” at the Café Imperiale. 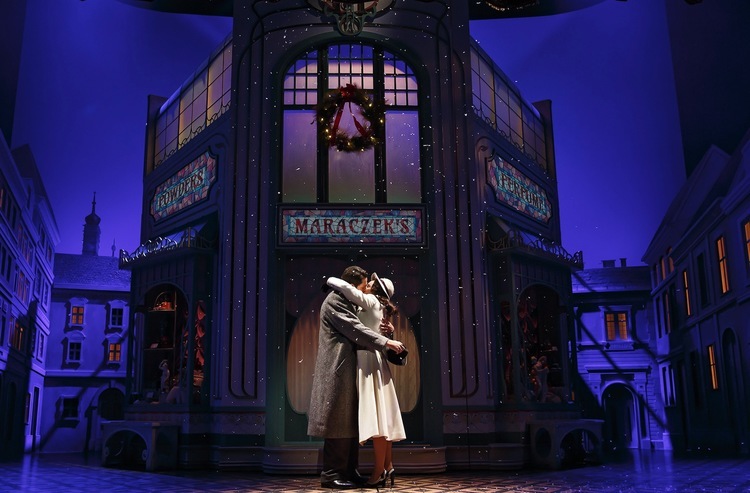 Act Two’s increasingly frenetic “Twelve Days to Christmas” showcases the company one last time before each of the lead characters has their subplots tied in neat bows. The finale of the show is the denouement of the central romance rather than a splashy song and dance number. Rarely seen in Australia, the last professional season of She Loves Me was in the very early days of The Production Company, starring Lisa McCune and Philip Gould. As a piece of nostalgia about the retail trade, the work could be seen as a forerunner to the recent Australian hit Ladies in Black. The well-worn plot has seen many incarnations, including popular 1988 movie You’ve Got Mail. A pair of co-workers bicker and crackle, not knowing they are each others’ secret pen pal. Director Scott Ellis supports the old fashioned nature of the tale by retaining the original setting of Budapest, 1934 (although the characters all come across as very American). Continuing the old world vibe, Ellis presents the comedy in a sincere manner rather than with a knowing wink. The period allows set designer David Rockwell to create an attractively sumptuous world. Initially part of the streetscape, the set for Maraczek’s Parfumerie opens like a giant doll’s house to reveal the ornate interior, before opening and rotating to portray the back stockroom. After a dramatic incident turns the back cyclorama from sky blue to blood red, the action shifts to the plush crimson interior of the Café Imperiale. A newcomer to golden age musical revivals, costume designer Jeff Mahshie demonstrates a wonderful eye for vivid colour and delectable patterned fabrics. Mahshie and Rockwell have clearly worked hammer in glove such is the integration of the colour palette all aspects of design. Situated overhead in two boxes flanking the stage, the orchestra of 14 musicians works under the baton of legendary music director Paul Gemignani. Jerry Bock’s score, written in 1963, is pleasingly sophisticated, featuring the sort of witty use of musical motifs still very popular today. A clever example comes when “Tonight at Eight” when Georg knocks over a music box and its melody is woven deftly into that moment of the orchestration. Another aspect where the score is ahead of its time is the inclusion of several extended musical scenes rather than a score full of self-contained songs. Facilitating this integration, Sheldon Harnick’s lyrics blend seamlessly with Joe Masteroff’s book. Unbelievably, Laura Benanti has not performed in a Broadway musical for some five years. She is set to be adored as darling shop clerk Amalia Balash, a role that suits her comic sparkle, simmering vulnerability and golden soprano perfectly. 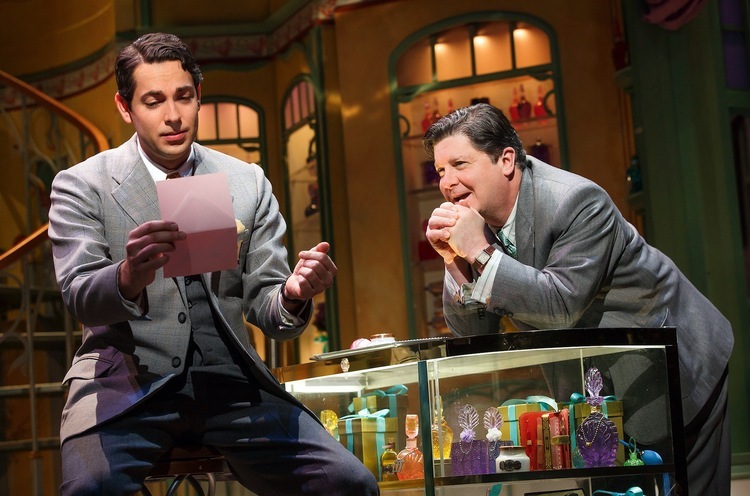 Zachary Levi proves a terrific music theatre leading man as the well-intentioned Georg, delivering nifty comedy, snappy dancing and warm vocals. His ebbulient rendition of the “She Loves Me” is the rare example of the ballad as a showstopper. 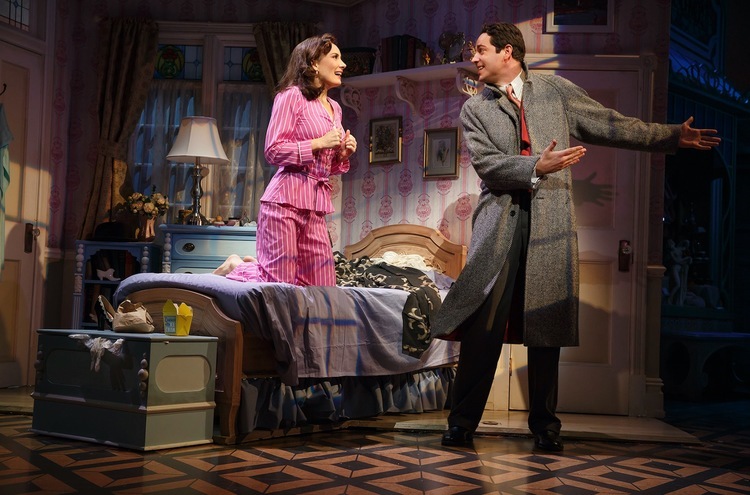 Levi and Benanti make an attractive pair, and enjoy strong chemistry. 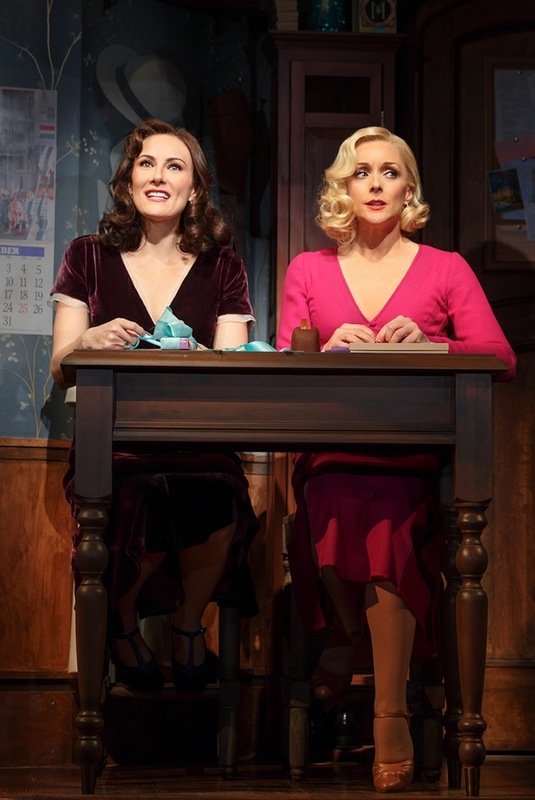 Broadway (and television) goddess Jane Krakowski eschews her trademark diva role for the wholesome Ilona. Whether it impressing with the splits or selling a song, Krakowski is in fine from and is fabulous to watch. Her performance of act two’s “A Trip to the Library” is practically an entire musical in its own right. Gavin Creel slithers about as lothario Steven Kodaly, avoiding a one-dimensional characterisation with layers of charm and panache. Michael McGrath delivers another beleaguered good guy, demonstrating his expert touch with comic delivery. Relative newcomer Nicholas Barasch gives an endearing, fresh performance as the earnest delivery-boy-come-clerk Arpad Laszlo. 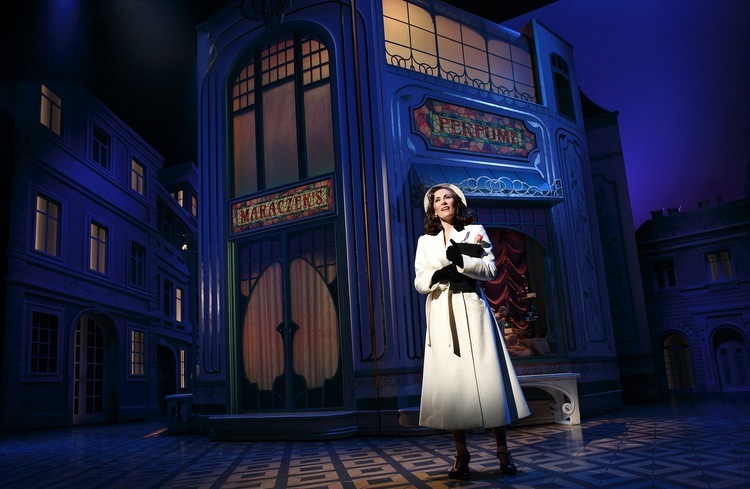 A limited run, She Loves Me is the musical comedy show to catch this Spring on Broadway. She Loves Me was reviewed 2pm Saturday 26 March 2016 at Studio 54, NY where it plays until 12 June 2016. Excellent, Simon! I love Benanti…and you are SO making me want to attend this! A delightful show and a wonderful review. Great to finally meet you in person, too. See Daddy Long Legs too if your schedule allows it. Thanks Nick. Great to meet in person! I’m sure we’ll see each other at the theatre in Melbourne now too. Not sure I will be abel to fit in Daddy Long Legs, but glad to hear you enjoyed it.